Verdict: Black Tea with soft lemon flavours. Bright and refreshing mouthfeel - almost like eating a spring of mint, but with great aromatic flavours filling your nostrils. It was definitely delicious. I'll have to brew this as a Cold Brew and/or Chemex and report back. On my recent trip to NYC, I made a detour over to visit Sammy from Keffa Coffee. 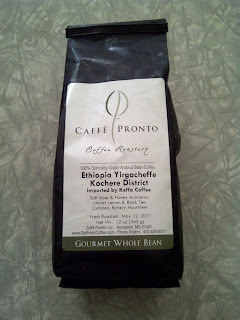 We met in Toronto during Detour/DH/Keffa Coffee event featuring Ethiopian Coffee. The full write-up is happening, the NHL playoffs have been keeping me occupied. On our last stop of our Espresso Adventure in the MD, DC area was to Caffe Pronto. You might have heard the name if you were following the SCAA. Andy Sprenger took home the US Brewers Cup - and will be competing with the likes of James Hoffman from Sqaure Mile in Masschrict, NL. I've personally been to Masschrict for their marathon last year, and it's the vacation destination of the Netherlands. With it's spot located in the southern most region of the Netherlands, the charm of cobble stone roads and the friendly dutch will be a great experience for the event.